Although Johannes and Elfriede Höber succeeded in escaping from Germany with their nine-year-old daughter Susanne before War War II, Elfriede’s mother, Clara Fischer, and her three brothers remained behind. In 1943, Düsseldorf, where Clara lived, was heavily bombed by United States and allied forces. 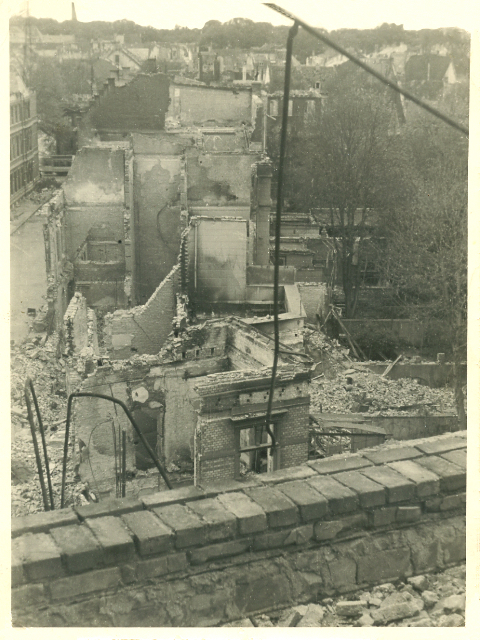 This photograph was taken from the ruins of Clara’s apartment, showing the destruction of the city. Having lost everything, Clara fled with her two grandchildren to the comparative safety of a small town in the Alps, where she lived out the rest of the War.